Our goal is to create customised solutions for every type of building. We audit your building to identify the best energy saving opportunities. Then we customise solutions to match your budget requirements. After that we install innovative, user-friendly and energy-efficient products. All while providing an outstanding service. 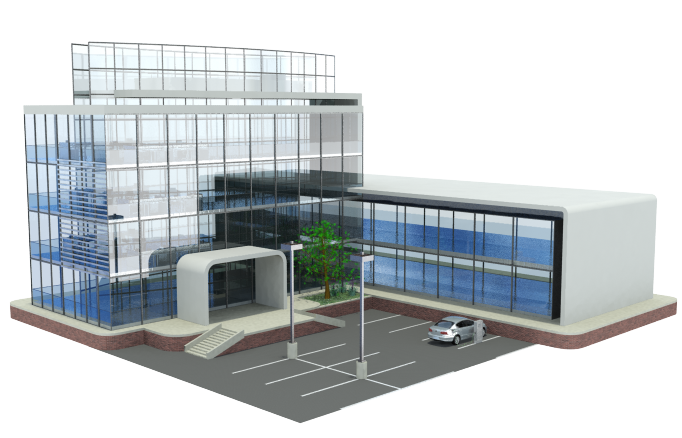 The energy bill of an office building comprises costs of lighting, heating, cooling, and the use of office equipment. We can help you improve efficiency in these areas of energy consumption and turn your building into an occupant-friendly work environment. Our solutions can help you demonstrate a commitment to sustainability and achieve a positive company image. Schools and universities strive to offer quality education, attract students, and provide a comfortable learning environment. The challenge of meeting these goals is even bigger in times of growing energy prices and shrinking budgets. As EcoXpert's qualified by Schneider Electric, we can become a partner for your educational facility and help you contain costs, leverage energy savings, and demonstrate a commitment to sustainability. Retail businesses operate under a growing pressure for profitability and very low margins. Improving energy efficiency is a simple way to reduce expenses. a 20% cut in energy costs represents the same bottom line benefit as a 5% increase in sales. We can help your new or existing retail building become a place where energy efficiency and customer comfort ensure commercial success. Hotels and restaurants operate in a highly competitive market with rising energy prices and strict regulations. We're qualified by Schneider Electric to help reduce the impact of energy costs on your business by applying tested energy efficiency measures. With our solutions, your hotel or restaurant can offer superior guest comfort while achieving high profitability, flexibility, and energy efficiency. Our challenge as EcoExperts is to make your buildings energy consumption smarter, while keeping you in the loop throughout the entire optimisation process. Carry-out an energy diagnosis - We will conduct a walk-through energy audit to measure consumption and identify energy waste or inefficiencies. Monitoring and improvement - We can install an energy monitoring and reporting system, to raise user awareness by tracking consumption and highlighting areas for improvement. Optimisation through automation - We can provide automated, energy-efficient solutions to optimise your energy consumption, that can be tailored to your specific needs. Continuous improvement - We can provide ongoing energy efficiency services to help and analyse usage, identify trends and opportunities, and keep your energy efficiency program relevant. For more information on the energy efficient solutions and products we provide as part of the EcoXpert process, please follow the links below to navigate around the website. Many homes and businesses have been on the same tariff for years even though their usage patterns have changed. Prices have gone up and we're here to help. Utilise your energy more effectively with efficient lighting, motor starting solutions, power distribution, power factor correction and voltage optimisers. From hot water systems to pool pumps, having energy efficient and properly engineered intelligent products in your home or business can dramatically reduce your energy consumption and use it more wisely. By choosing accredited installers, customers can feel confident that they will receive high quality, safe and reliable energy efficient solutions and services. Is your electrician accredited? See our accreditations page for more info and why it matters.